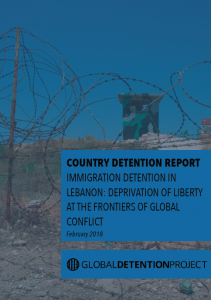 Immigration detention in Lebanon: Although Lebanon does not consider itself a country of asylum, it has the world’s highest per-capita concentration of refugees, most of whom have fled conflict in neighbouring Syria. Refugees are increasingly treated as a security threat and economic burden, and they have found themselves under growing surveillance and restrictions. The country is also home to a large number of migrant domestic workers from countries like the Philippines, Ethiopia, and Kenya, who are subject to the kafala system and are particularly vulnerable to detention. Detained non-citizens are typically charged with violations of Lebanese law on account of their legal status. Upon release from prison, they are systematically detained by General Security for immigration procedures. With detainees forced into over-crowded facilities with insufficient food and medical treatment, as well as limited legal aid, rights observers have expressed increasing concern for migrants, asylum seekers, and refugees in the country.